Well, almost. Our newest natural food store, Greenline Organic, on Austin St., is giving away a box of eggs with any purchase of $12 or more. One of the employees told me this promotion will last another month or so, as long as supplies last. So if you’re into eggs, and haven’t paid a visit to this attractive new organic store, now is the perfect time! I stopped into the new Greenline Organic store on Austin today. As I walked inside I heard one lady exclaim: “Our neighborhood needs more places like this!” And that about sums up my impression too. I think it’s a charming addition to our local food shopping choices here in Forest Hills. The first thing I noticed is the store is very upscale-looking, and it overflows with a very attractive arrangement of produce onto the sidewalk in front. The store has everything you’d expect from an organic market, and everything they stock looks very fresh. I noticed they have some meats and salads like chicken salad and tuna also. I’m not going to complain, but I have to point out that the store may test your shopping patience a bit! As you head to the back where the store splits into two sections, one for veggies and one for dairy, there is room for only one person at a time to fit into those spaces, unless you are thin as a rail. But like I said—as I munch on the delicious red grapes I bought from the place today—I am not going to complain. We definitely can use more stores that are as inviting and pleasing as this in Forest Hills. Speaking of the grapes I bought, they cost me $3.38 for the bag. I also bought a couple of apples which together came out to 83 cents. I also bought a box of organic tea for $3.39 (the same box is priced $4.99 at Natural). So there you have my report from my brief sojourn into our new organic store here in The Hills. I am interested in hearing your impressions as well, so feel free to share them below. Also see the previous post about this store for more info on it, including another detailed review of one shopper’s experience there. Just a quick FYI — the new Greenline Organic store on Austin St., which opened today, is open 24 hours, according to one reader who stopped by there already. I will pay it a visit this weekend to check it out and then post my impressions. I’ve had this theory for the past several years that you can tell when a neighborhood is improving by the appearance of very specific types of retailers or restaurants. I came up with the theory during the time I spent living in Park Slope and watching that neighborhood change. Let me explain. The first thing was the appearance of Thai restaurants, believe it or not. Thai food places were among the first places to open in Park Slope when it began to gentrify. Here in Forest Hills we have certainly seen those open over the past few years, along with other upscale Asian fusion restaurants. 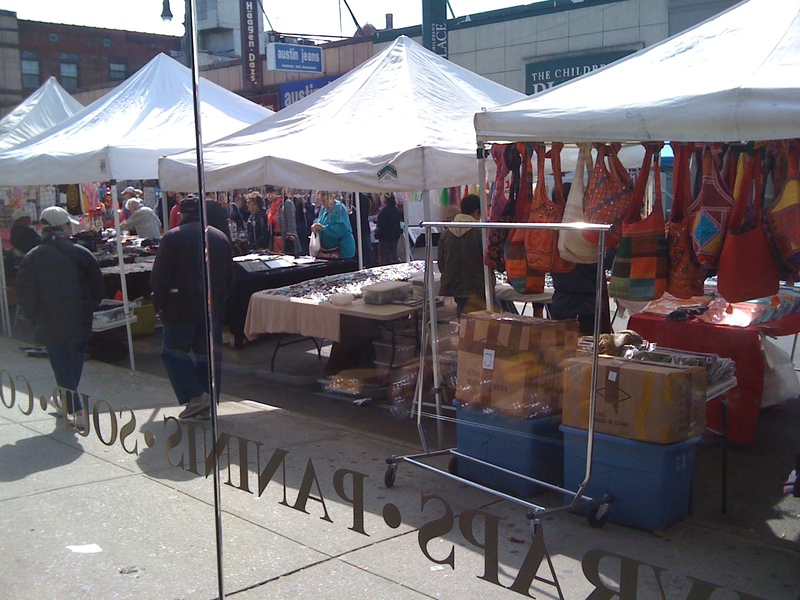 The other kind of retailer that began to move heavily into Park Slope were organic markets. And lo and behold, we have begun to see them begin to multiply here in Forest Hills as well. 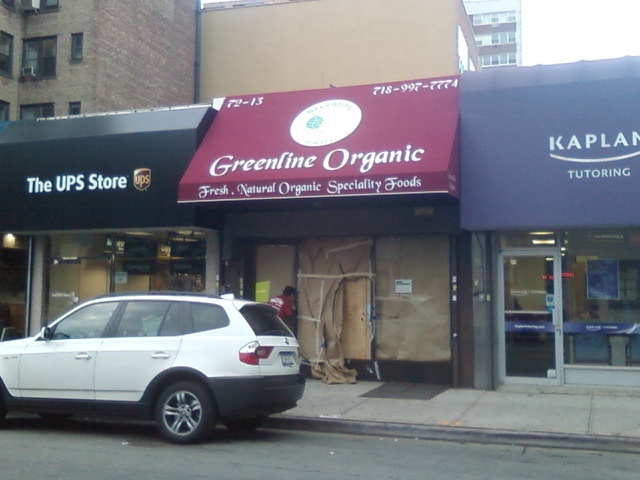 And that leads me to the real reason for this post: the opening of another organic food place, Greenline Organic, this time on Austin St. between 72nd Ave. and 72nd Road. Isn’t it interesting how different Forest Hills can be from one day to the next? Last night, we had helicopters buzzing overhead as a disturbed man went slashing people with a razor blade on Austin. While today, on a crisp, Autumnal morning it’s as if that never happened. We have a family-friendly street fair on Austin going on in the same place as last night’s craziness.